Stems: Erect, usually simple or sparingly branched above, longitudinal ridges, rough, short-hairy. Leaves: Mostly opposite, uppermost often alternate, simple, rough; stalks .4 to 2.8 inches long; blades of lower and middle leaves egg-shaped to nearly circular in outline, 4 to 8 inches long, 1.2 to 7.8 inches wide, usually palmately 3- to 5-cleft; margins usually toothed; upper surface somewhat spreading-hairy; lower surface nearly smooth; upper leaves smaller, 3-cleft to nearly entire. Inflorescences: Monoecious (staminate and pistillate heads occur at different locations on same plant); heads of staminate florets in racemes, elongated, to 6 inches long, panicle-like, terminal; heads of pistillate florets in clusters in axils of bracts below staminate inflorescences. Flowers: Greenish-yellow; staminate heads short-stalked, saucer-shaped, 1/12 to 1/6 inch across, 6-8-lobed; florets 3-25+; pistillate heads with egg-shaped involucre, about 1/6 inch long, 1-flowered. Fruits: Bur-like, pyramidal, 1/5 to 1/3 inch long, hard, formed by floral bracts, glabrous or sparsely-hairy; beak 1/25 inch long, surrounded by 4-8 blunt spine-like projections; seed 1, small. Habitat: Moist disturbed sites, stream banks, roadside ditches, margins of ponds and lakes, old fields, waste areas, pastures. Forage Value: Unpalatable for livestock, though horses will sometimes eat it. Deer eat the leaves and pheasants, quail, prairie chickens, and songbirds eat the fruits. Uses: Native Americans rubbed crushed leaves on insect bites and steeped the leaves to make a tea taken for fevers and pneumonia and used as a wash for hives. The root was chewed to alleviate fear at night. Stem fibers were used as thread. 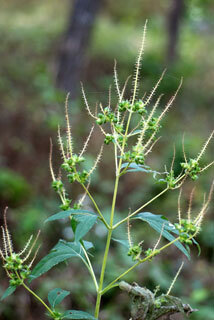 Giant ragweed provides wildlife cover. Comments: Giant ragweed is highly variable. It is wind pollinated and is a major cause of allergy symptoms in the fall. It will form colonies in disturbed areas. Can be a problem weed in cultivated fields.